I recognized the threat, but, given the errors inherent in the VOR system, I thought it unlikely that two pilots would find themselves directly over a VOR at the same time. Barry Schiff offered a similar point of view in an installment of his Proficient Pilot column, SLOPpy flying, in the July 2008 edition of AOPA Pilot magazine (available only to AOPA members). 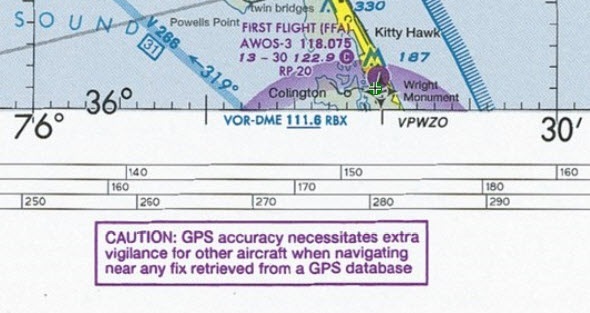 GPS and the latest autopilots, however, have increased the threat of a collision near navaids, intersections, fixes, and even when flying along airways. The danger is a terrific example of unintended consequences. I’m still astonished at how accurately GPS can guide me, whether I’m hand-flying a squirrely airplane like my Extra 300L or cruising on autopilot in my Beechcraft A36. Ground tracks of my cross-country trips show little deviation from courses that define routes that I fly frequently, and I routinely cross fixes very close to, if not directly over, the points that define them on charts. In the picture below, the flight plan track is green and two GPS tracks (magenta and yellow) from trips along the same route in the Extra show how accurately one can fly with GPS, even without an autopilot. 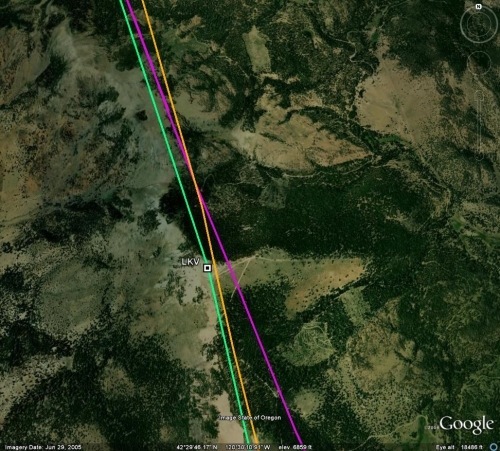 For reference, the distance between the planned route and the magenta line at LKV is about 0.09 nm. The course generated by the GPS unit during each phase of flight is a constant width (except when flying certain types of RNAV approaches, during which the course width narrows as you approach the runway), and the box in the airplane is able to determine position to within a few meters. 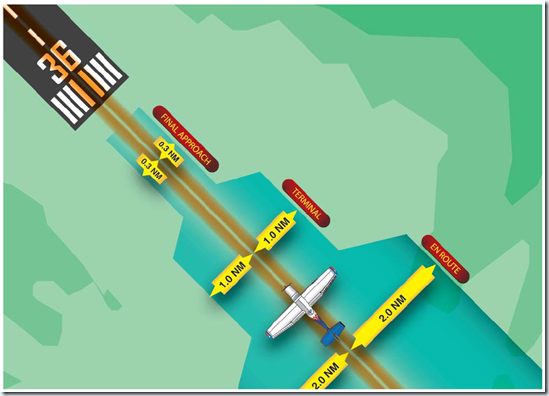 IFR-approved GPS units meet the Required Navigation Performance (RNP) standards for en route, terminal, and approach operations (see illustration below), which means that they can guarantee that the airplane will remain with those RNP limits 95 percent of the time. 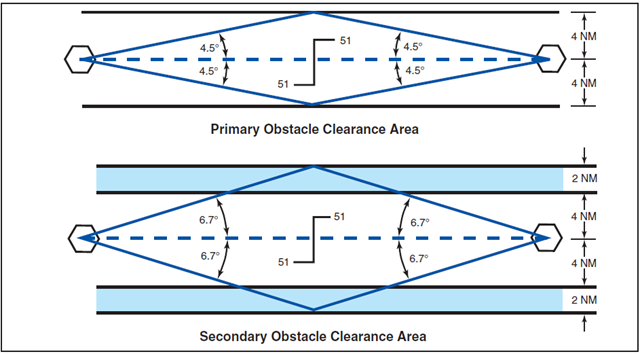 Note that when using a GPS unit, the boundaries of an en route course are 2 nm either side of the centerline—half the 4 nm route boundary defined for a VOR airway, which is determined by the angular courses that emanate from a VOR, each of which widens with distance from the station. Near a VOR, in the “cone of confusion,” the signals become increasing unreliable, and it’s impossible to track a course precisely. An autopilot using GPS to track a course keeps the airplane right on the centerline, and except when using turn anticipation to ensure a smooth transition to a new course, it drives the aircraft right over the fix. Newer autopilots, which feature GPSS steering, do so remarkably accurately and smoothly. “The Devil at 37,000 Feet,” a feature in the January 2009 edition of Vanity Fair by William Langewiesche, is a compelling account of a mid-air collision over Brazil in which, as Schiff noted, the accuracy of GPS and modern flight control systems probably played a significant role. 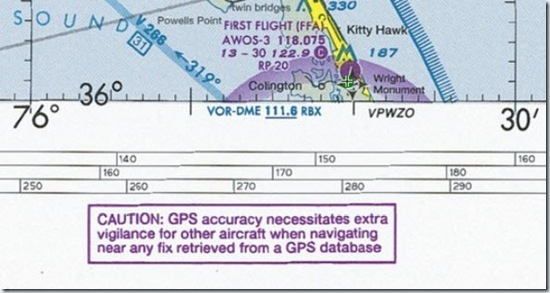 Add to these factors the proliferation of RNAV waypoints on both IFR and VFR charts, especially the VFR waypoints being added to terminal area charts used in the busiest airspace, and the threat of aircraft converging on specific points in the sky has increased significantly in the last five years. So the old advice still holds; we just have a lot more points of convergence to worry about. When cruising along, let the GPS do the work of tracking the course, and especially near waypoints in VMC, look out the window instead of pointing at the moving map and marveling at how today’s advanced navigation systems take you to invisible points in space. The introduction of IFR-approved GPS units has caused much confusion among pilots who wonder when they can use those units in lieu of or as supplement to ground-based navigation aids. 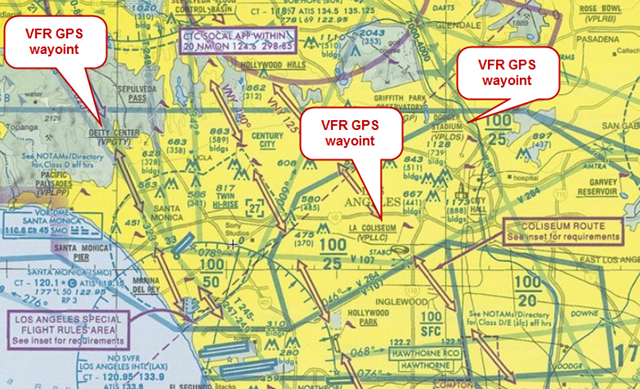 Operators may use a suitable RNAV system in the following ways. 1. 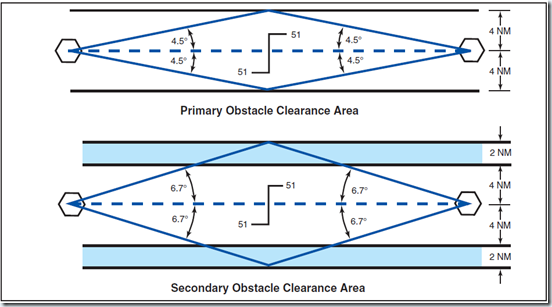 Determine aircraft position over or distance from a VOR (see NOTE 4 below), TACAN, NDB, compass locator, DME fix; or a named fix defined by a VOR radial, TACAN course, NDB bearing, or compass locator bearing intersecting a VOR or localizer course. 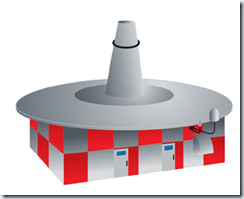 These operations are allowable even when a facility is explicitly identified as required on a procedure (e.g., “Note ADF required”). Here’s a YouTube video of yesterday’s aerobatic ride in the Extra 300L for a gentleman from Texas. A layer of ground fog east of Lake Sammamish made for some nice views. The FAA has published another Notice of Proposed Rulemaking (PDF here) that would make several significant changes to training for the commercial certificate and the private certificate and instrument rating, the definition of "complex aircraft," training in Beech aircraft with single, throwover control yokes, and other areas of Parts 61 and 141. The document is worth reviewing, especially if you’re a flight instructor. If the changes follow the usual process, the new rules won’t take effect for at least a year. Comments are due November 30, 2009.
the pilot, flight instructor, and pilot school certification rules are necessary to ensure pilots are adequately trained and qualified to operate safely in the National Airspace System. The FAA has determined these proposals are needed to respond to changes in the aviation industry and to further reduce unnecessary regulatory burdens.